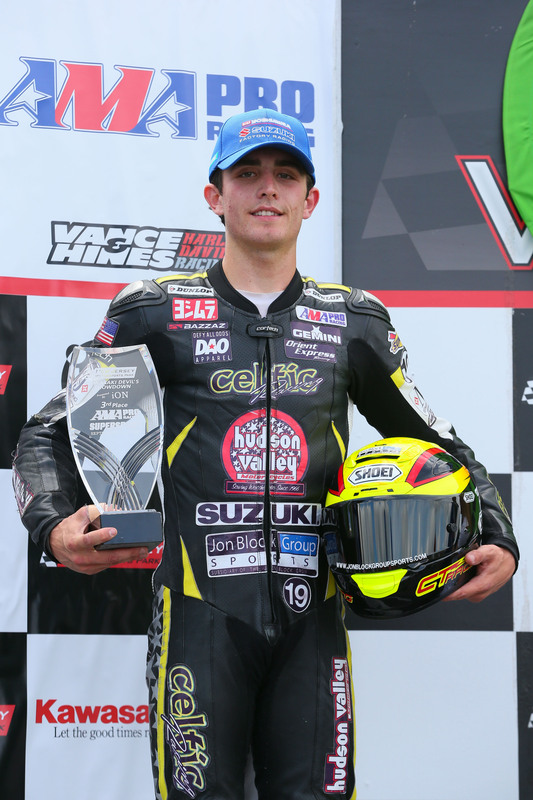 Celtic Hudson Valley Motorcycles Suzuki Racing had a strong 2014 season in AMA Pro Racing SuperSport, with #19 Wyatt Farris taking third place in the overall standings, and teammate #5 Corey Alexander taking fourth position. The final race weekend at New Jersey Motorsports Park saw Farris finish fourth on Saturday, and third on Sunday, with Alexander taking twenty-third on Saturday and sixth on Sunday. Saturday’s race at NJMP was cut short due to rain which created slippery conditions and several crashes in the forty-eight rider field. The start of the race was relatively dry with damp patches around the track, but by lap eight the rain was falling and at least four riders went down as the track conditions quickly changed. Wyatt Farris had a good start on his #19 Celtic/HVMC Suzuki GSX-R 600 and was in the pack of riders chasing down the leaders most of the race. Unfortunately Farris would succumb to the changing track conditions and went down on lap eight. Corey Alexander had a good start on his #5 Celtic/HVMC Suzuki GSX-R 600, but drifted back to twenty-third position where he would finish the race after the flag waved. Alexander never felt comfortable on the bike in the damp conditions, and the shortened weekend format did not work to his benefit. The weather for Sunday was almost perfect for racing, with all the rain and wet conditions from the previous day just a memory. Again, Farris had a good start and Alexander was close behind as the lead group pulled away from the field. Farris and Alexander would do battle for most of the race with De Keyrel and Miller Jr. in a four rider battle for third place. Farris enjoyed a race long battle with De Keyrel from flag to flag, but was able to stay in front at the checkered flag – taking third place in the championship and the final spot on the podium as well. Alexander rode well and was much more at ease, but could not find a way past Miller Jr. or De Keyrel before the checkered flag dropped and would finish sixth on Sunday, securing fourth overall in the season championship. The 2014 season was a demonstration of consistency by Wyatt Farris, with only two finishes outside the top five, and four podium finishes as well. The 2014 season was a demonstration of consistency by Wyatt Farris, with only two finishes outside the top five, and four podium finishes as well. Wyatt Farris was pleased to finish the season in third position, and stated that “Saturday was a very interesting race with the conditions. I don’t have much experience ridding in wet weather, so I was happy to bring it home in fourth. Going into Sunday and knowing it was going to be dry, I felt we had a really good chance to be at the front. Unfortunately, my team and I made the wrong tire choice and I didn’t have the pace that the two leaders did. Even though I really wanted to try and fight for my first win, being on the box in third and ending the season third in the championship isn’t so bad. I really have to give it up to the whole Celtic/HVMC Suzuki Racing team! Barry, Richie, Will, Dustin, Chris, Mark, Tim, Spike, Skip, Pete and the rest of the boys back at Gemini worked their butts off for Corey and me all year long. Along with them, I want to thank all of our team sponsors that supported us this year, it’s a honor to work with such great companies. Last but certainly not least, I want to thank my personal sponsors and supporters, this year would not have been possible without the support from the following: Jon Block Group Sports, Cortech Leathers, Shoei Helmets, Above Category, CT Racing, Defy All Odds, Osmo Nutrition, Jason Pridmore, and my family and friends.” You can keep up with Wyatt Farris via Instagram or Twitter @wyattfarris19 or join him on Facebook at www.facebook.com/wyattfarrisracing . For Corey Alexander, the 2014 season started with three straight wins and four pole positions, and then became much more challenging for the young rider. Certainly having learned a great deal, Alexander said “I’d be lying if I thought this is how the year would’ve ended after how it started. I’m definitely disappointed to not be bringing home another championship for my team and crew. I’m even more disappointed in myself after this weekends results. For a few different reasons I lost a bit of confidence, and as well the big gap between races and the two day schedule really threw me off. We have one of the best hardest working group of guys in the paddock, and they deserved more than I was able to give them. Unfortunately that’s racing and we can only move forward. I have to give a huge thanks to the whole Celtic Hudson Valley Motorcycles Suzuki Racing team, my crew, and all of our sponsors. We were lucky enough to be out there racing, being on the best equipment as well, it’s a blessing. I’m anxious to see what next year holds, hopefully only positive things from here forward. Thanks Mark, Tim, Barry, Uncle Richie, Skip, Chris, Jason, Jon, and Pat for making this year possible! Many thanks to all of the team sponsors for their support, and my personal sponsors who helped make this season possible, including MJRS Freeman, Spidi Leathers, XPD Boots, Arai Helmets, Boxed Water Is Better, Defy All Odds Apparel, Oakley, Crossfit OSA, and Lapizta Watches.” Please follow Corey Alexander on twitter and Instagram via @corey5alexander , keep track of him on Facebook at www.facebook.com/corey5alexander , and check out his webpage – www.corey23.com – as well. Everyone at Celtic / Hudson Valley Motorcycles Suzuki Racing would like to thank our team sponsors for all the help and support they provided over the 2014 season. These sponsors include: HVMC Racing, Suzuki, MJRS Freeman, Orient Express, Jon Block Group, Yoshimura R&D, Bazzaz, Gemini, K-Tech Suspension, Pitbull, Maxima Racing Oils, Galfer, Chicken Hawk, Motion Pro, Armour Bodies, Saddlemen, Star School, DesignStar3, Zero Gravity, Signs Ink, GB Racing, DID, and Vortex. We look forward to next season with excitement and eagerness! Celtic Racing was established in 2001 by Barry Gilsenan, and over the past 13 seasons has established itself as a premier privateer racing team. Celtic Racing has seen consecutive championship seasons in AMA Pro Racing SuperSport from 2012 to 2013. Development of riding talent began with two-stroke 125cc, and 250cc machines competing in professional and regional championship events. 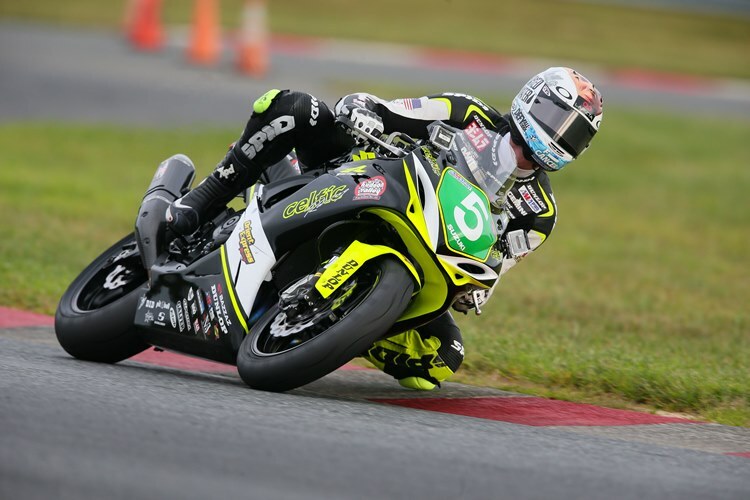 More recent Celtic Racing efforts have focused on AMA Pro Road Racing in the Daytona SportBike and SuperSport classes with Ducati, Honda, Suzuki, and Yamaha four stroke motorcycles. Gilsenan’s talent for coaching racers of all ages and abilities has brought Celtic Racing worldwide attention and recognition, with many former Celtic Racing riders now competing on World Championship levels. For more information regarding Celtic/HVMC Suzuki please join us on Facebook at www.facebook.com/celticracing and follow @celticracing on twitter and Instagram – we appreciate all your support! Hudson Valley Motorcycles has been serving New York’s Hudson Valley and Westchester County as well as Connecticut, Massachusetts, New Jersey, and greater New England with Ducati, Kawasaki, and Suzuki Motorcycle/ATV Sales, Parts, and Service since 1966. Established by Richard Alexander Sr, the dealership is a family run business with employees who have been part of the family for decades in some cases. With deep and long standing customer relationships around the region, Hudson Valley Motorcycles is known for outstanding customer service, in-depth product expertise, and the foremost service department for machines of all brands. Please visit www.hvmotorcycles.com, join them on Facebook at http://www.facebook.com/HVMotorcycles or follow them via @hvmotorcycles . Established in 1973, Orient Express is celebrating its 41st year as a high performance motorcycle parts distributor and race shop. Orient Express offers engine and motorcycle building services, precision machine work, suspension servicing, and dyno tuning services. Orient Express has an extensive history of racing, including support of both professional and amateur race series and individuals. For more information regarding Orient Express, or to find out what Orient Express can do for your racing success, please call 800.645.6521 or 631.231.9552 (NY/International), visit http://www.orientexpress.com or join them on Facebook at http://www.facebook.com/OrientExpressRacing . Images courtesy of Brian J. Nelson Photography.